Steel Buildings - Stadium Construction, Grandstands, Steel framed grandstands, stadiums, auditoriums, arenas. REIDsteel are probably the only structural steel company that can design and build steel framed grandstands with correct viewing standards, correct exit stairs and vomitories and meeting all structural and safety standards. A REIDsteel grandstand is simple, cost effective, easy to use and to maintain, and maximises the number of seats, boxes and useful floors. We have probably designed and built more grandstands than anyone else since Archibald Leitch. We have built the smallest (Stevenage, Altrincham etc. etc.) 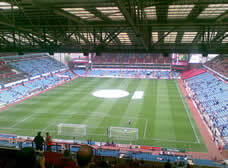 to the largest - The Villa Holte End is the biggest end stand in Europe. 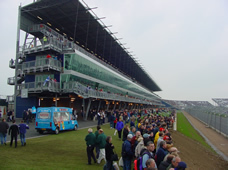 We have built straightforward workmanlike stands like the award winning 3 stands in a season development at Tranmere Rovers, to the highly exotic architectural statements like the Rockingham Motor Speedway Grandstand. An arena combines the REIDsteel expertise with very wide span structures and with grandstands. We can use the REIDsteel Patent Arch Span Frame. We can design huge spans with inbuilt seating, stages, light and set hoists, lighting and loudspeaker hoists. Naturally they can have office space, conference rooms, bars, ballrooms and restuarants. Arena/Stadiums with opening roof. The REIDsteel Patented Arch Span roof frame works really cost efectively simply supported on wheels or rails. REIDsteel can design and build the largest moving roofs.